Peter A. Eklund Choral Series | Santa Barbara Music Publishing, Inc.
Peter A. Eklund annually conducts instrumental and choral ensembles in Western Europe, Eastern Europe, Southern Europe, and throughout North America. 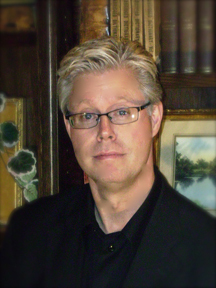 One of the most active and versatile international conductors today, Peter A. Eklund possesses a unique ability to work effectively with musicians at all levels of performing capability and experience. His concertizing/clinician schedule averages 60 national and international concerts annually and includes a wide array of professional, orchestral, collegiate, liturgical, festival, and youth/student ensembles throughout North America and Europe. Trained as a classical pianist and organist in the finest traditions of Western historical music, he now is also a strong advocate for ethnic and world music spanning all genres. His academic choirs have performed on numerous American Choral Directors Association regional and national conventions where their frequency of performance set unprecedented national records (over 30 MENC and ACDA regional and national invitations). Eklund has conducted his choirs in many of the world's greatest performance venues including, Carnegie Hall (numerous times), Washington DC's Kennedy Center, the National Cathedral, and Shrine of the Immaculate Conception, Orchestra Hall in Minneapolis, St. Mark's Basilica in Venice, Christ Church in Oxford, St. Paul's Cathedral in London, Mozart's Salzburg Cathedral (where he conducts yearly), Paris's Notre Dame (also conducting yearly), St. Stephen's in Vienna, St. John the Divine and Alice Tully Hall in NYC, the abbey church of St. Hildegard von Bingen, and in other famous cathedrals, abbeys, and performance halls in Prague, Milan, Cambridge, Munich, New York, Chicago, London, Coventry, Canterbury, Chartres, Reims, Rouen, Mt St. Michel, Lucerne, Metz, Regensburg, Strasbourg, Paris, Stratford on Avon, Bratislava, Rome, Florence, and Verona. Dr. Eklund studied conducting and score-study with American Ditson Conductor's Award winner and International Mahler Medal-winner James A. Dixon, American Choral Directors Association past-president (and University of Nebraska–Lincoln alumnus) William Hatcher, and nationally-recognized scholar/conductor/author/pedagogue/administrator Don V Moses. Current and recent engagements include(d) conducting All-State choirs in Minnesota, Colorado, Indiana, South Dakota, Georgia, Missouri, and Alabama, master classes and adjudicating/clinic work in Hawaii, California, Florida, Virginia, New York, Iowa, Arizona, Missouri, Wisconsin, Pennsylvania, Ohio, Indiana, Minnesota, Kansas, Texas, Wyoming, Kentucky, Illinois, New York, Wisconsin, North Dakota, New Mexico, Oklahoma, Connecticut, Massachusetts, Tennessee, Washington D.C., North Carolina, Mississippi, and Chicago, collaborating with NETV on a state-wide collegiate choral broadcast (nominated for regional Emmy), conducting a regional ACDA honor choir, and directing a summer youth honor choir trip to ten countries. He divides his time among four important roles: conductor, guest lecturer, editor (his own choral series with Santa Barbara Music Publications), and teacher/mentor (with numerous former students performing professionally on both US coasts: Broadway, Lincoln Center, TV, and Oscar winning movies - and everywhere in between), and is the Director of Choral Activities at the University of Nebraska-Lincoln, where he heads the Masters and Doctoral choral conducting programs, conducts the nationally recognized University Singers, and conducts the nationally renowned University of Nebraska Varsity Men's Chorus (both national MENC selected performance ensembles, the former in 2002 - Nashville and the latter in 2004 - Minneapolis). His publications are found at Hope Music, Colla Voce, Concordia Publishing House, Kimmel Publishing, and Santa Barbara Music Publishers. However, his greatest role of all is that of husband to Teresa and father of their four sons: Ben, Bryant (both choral music education majors), Brady, and Brantley. In his spare time, he is an occasional golfer (actually having scored a hole-in-one), enjoys the tracker pipe organ in his home, and is a reluctant but diligent gardener. Teaching Philosophy: When working with musicians of all ages, nothing is more important than the instrumentalists' & singers' preservation/health, education, work ethic, and life-enrichment. Musicians in our ensembles know that they will vocalize and make music in a healthy manner that will assist them in all areas of professional music-making, as a result of performances of literature of the highest intellectual/artistic standards, and work in rehearsal situations and lab settings that will encourage professionalism, self-analysis, and advanced musicianship. Both performers and conductors alike will be schooled in efficient rehearsal technique, subtle informed performance practice geared for both the 21st-Century performer and listener, voice pedagogy, intelligent musical nuance, advanced interpretation, age-appropriate tone production, and other aspects of professional music-making. Subtle conducting gestures will always allow the audience to focus on the performers. And these minute gestures will also allow the listener to focus on the composers' innate intentions. The greatest performances allow the listener to focus on the music, the marriage between lyric and line, the message, the performer/musician, and the art, not the conductors or the conductors' gesticulations. Beginning and advanced students who share the love of music-making at the highest and most advanced level are a joy to instruct and nurture.